The computer software industry is massive and new technologies mean that it is constantly evolving and new applications seem to appear daily. As a parent or teacher (or anyone who is interested in child development) it can be hard to keep on top of what is good and bad in the world of software, and whether computers have a place in childhood at all. We’ve compiled this simple fact sheet as an introduction to child friendly computer software and some of the issues surrounding kids and computers. 25% of Computer Game Players Are Under 18 But Only 1% of the Games Sold Are Designed As Kids’ Games. Computer games have developed a bad reputation over the years for encouraging anti-social behaviour in children however almost all cases where video or computer games have been cited as a problem it has been because the child is playing ‘adult’ games which often include inappropriate imagery and actions. 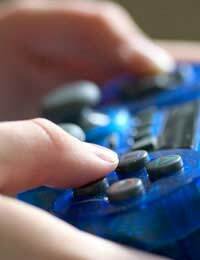 Choosing the right games for your children will ensure that their game play is safe. One of the criticisms levelled against children using computers is that the solitary nature of computing can inhibit the development of social skills. Using the right software computers can be a powerful tool in helping kids learn how to wok together in pairs or small groups. Kids can also use the Internet to work collaboratively with children in far distant countries. Learning basic skills can be enhanced through educational software, at home or in the classroom. There are many software options that use strong graphics, sounds and child friendly functionality to teach colours, numbers and shapes. Some of these are developed in association with learning specialists so do some research to make sure you’re getting the best product for your child. Entertaining and educating our children is big business but you don’t have to pay a lot for good software, especially not for very young children. Many major entertainment brands invest a lot of money in developing games and activities for the kids’ sections of their websites giving you free access to well designed, safe computer content for your child. Activities range from simple maths tasks to craft projects and even basic foreign language learning. When you’re getting your child started on the computer it’s really important that you guide them through the early stages. There’s no point having great educational software if your child doesn’t understand how to get started. The more time you spend teaching your child the basics the happier their relationship with the computer will be.